STOP IT RIGHT NOW: HAPPY BIRTHDAY!!!!!!!! Hope you have a great birthday. I love you. My high school art teacher's name was Mr. T. LOL...I love the A-Team! It's one of my all-time faves. My favorite character is Murdock. I love how crazy he is. 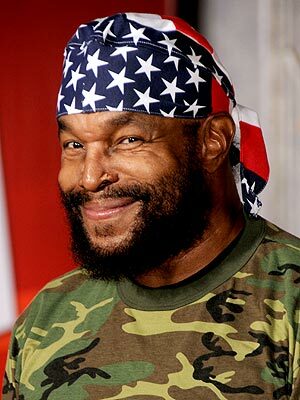 Mr. T is cool, too. You can always count on him. Ahhh..I miss this show! thanks so much for all of your lovely comments. what a sweet surprise! you made my day because i am an uber fan of your blog. 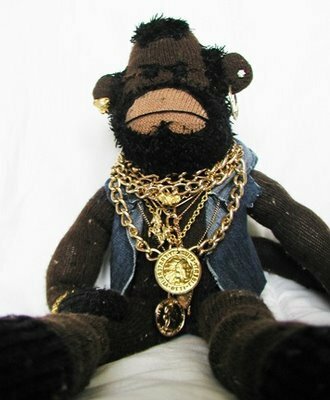 this is for mr. t. how rad would it be to have a sock monkey made in your likeness? Firstly, his smile is so wonderful here, secondly, OMG the sock toy, so awesome!